As we are still in the season of Lent, I would like to pass along, with Christine Datian’s permission, her most recent recipe found in TheArmenian Mirror-Spectator - ‘Yellow Split Pea Soup with Mint, Browned Onion and Yogurt Garnish’ – suitable for Lent - minus the use of chicken broth or yogurt garnish, of course! 1. In a large pot, sauté the onions, garlic, carrot, celery, and a dash of salt for 3 to 5 minutes over medium heat until onions are browned and vegetables are tender; stir so garlic does not burn. Add the water or broth and the split peas to the pot and stir. 2. Bring ingredients to a full boil, reduce heat, and cook for 40 to 45 minutes or until split peas are tender. Stir again, adding more liquid if soup becomes too thick. Season with salt, pepper, mint, and choice of seasonings to taste. 3. Using a ladle, place small batches of soup in a blender. Puree each batch then place in a bowl. Continue until all the soup has been pureed. 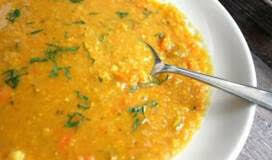 If you prefer the soup with more texture, puree only half of the soup. 4. Serve with Yogurt Garnish and additional toppings on the side (see below). While the soup is cooking, prepare the Yogurt Garnish. Combine the yogurt, garlic, mint, salt, lemon juice and olive oil in a small bowl. Cover and chill garnish until ready to serve.